noise and signal: Reject me, Baby! 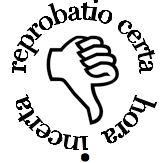 I recently submitted a story to the Journal of Universal Rejection (motto: "reprobatio certa hora incerta" (for which my translator gives "false contest hour uncertain", but that can't be right). I was expecting a rejection, you know. I mean, their guidelines say they will reject anything you send, and point out the advantages of knowing in advance what the outcome will be: reduced stress, no need to spend hours on your cover letter (which, you know, I do), and not least of all the satisfaction of knowing that you were rejected from one the most exclusive journals in the -- any -- industry. Wow! With all those advantages, I just had to submit. So I sent in a short I have called "Done" -- something of an experiment because it is comprised entirely of dialog (yes, I am that good) -- and waited (breathlessly) for my rejection letter, which I assumed would be arriving nearly immediately. For the first time in my life, a rejection to my story was not only assured but eagerly awaited. This time -- for sure -- I'd get exactly what I'd hoped for. Thank you for your interest in the Journal of Universal Rejection. under review. We will get back to you as soon as possible. Re the motto, I think reprobrio is much nastier than rejection. More like "opprobrium". You have much more to look forward to than you supposed. My authority on this is 6 years of latin taken 65 years ago. I am sorry about your friend. Re wondering where he is, I can offer you as a possible comfort the thought that nothing about being an athiest should deny you the benefit of a religions imagination. Where would you like him to be? Nick, I'm grateful for the help in translation. So how would you translate the whole phrase? Thank you for your kind sympathies. It's not where I want him to be that would best satisfy me; my greatest hope is that he is pleasantly surprised.